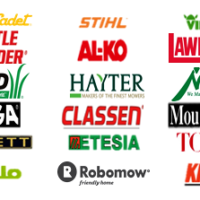 Home » News » Latest News » Lawn Mower Brands – Which to Choose? Lawn Mower Brands – Which to Choose? In previous news we at The Mower Shop have discussed how to choose a lawn mower and what are the common faults of lawn mowers. With so many different uses that each mower can provide as well as the different power and of course brands, where do you even start with choosing the right lawn mower for your needs? More of an industrial mower, this brand is perfect for areas where there is vast amounts of lawn. Golf courses, schools and estates can benefit highly from this commercial mower and with products easy to locate, you know parts are accessible should you need them. Manufacturers of lawnmowers and ride on mowers, this brand ensures that the upkeep of your garden is made that little bit easier. One of the biggest selling points is the multi-clip mulching function which offers another use for a mower. With ranges from this type of manufacturer offering the option of rear wheel, articulated steering and with the ability to handle all types of year round jobs, it’s easy to see why we promote this brand. There is a vast range of quality lawnmowers from this brand which have various features such as alloy cutting decks, blade clutches and so much more. As well as the main benefits, the other advantage is that the engines of these lawnmowers are from by other well-known brands such as Honda and Kawasaki. So if you are stuck on what equipment to choose for improving your lawn this year, then don’t hesitate to get in touch with us, or alternatively visit our page which explains more about the brands we have to offer.